Which Goalkeeper is Better: Today’s or Yesteryear’s? Author’s Note: This article discusses professional goalkeepers. Non-professional goalkeepers are exempt. Because today’s goalkeepers are so tall and so athletic, I believe it is much harder to score goals today than it was 20 or 30 years ago. In fact, sometimes I wonder how any goals are scored because goalkeepers make regulation-sized goals look like youth goals. Yet despite all the physical gains, tactical advancements, and acrobatic dives, I don’t believe today’s goalkeepers are held to the same standards as their predecessors. Which begs the question … which generation of goalkeepers is better—today’s or yesteryear’s? For me, it all comes down to expectations and accountability. Back in my playing days, goalkeepers were expected to hold onto all shots. Rebounds, of any sort, were unacceptable unless the ball was being tipped over the crossbar. Today, that philosophy has changed and I think for the better. Since today’s shots are stronger and more unpredictable (I’ve never seen so many knuckleballs), it is harder to make a save and hold on to the ball. Therefore, it makes sense to have goalkeepers deflect shots for a corner rather than trying to corral them and possibly give up a rebound. Plus, many times a fingertip is all a goalkeeper is able to get on the ball making a deflection the only option. Yet too often, I see today’s goalkeepers letting rebounds deflect back into the center of the field or deflect shots that appear easily catchable. Besides being unacceptable, rarely do I see or hear goalkeepers being held accountable for poor saves. Saves should never deflect back into the center of the field. The diagram below shows acceptable deflections (green) and unacceptable deflections (red). Granted, there are times when goalkeepers have to make reaction saves. 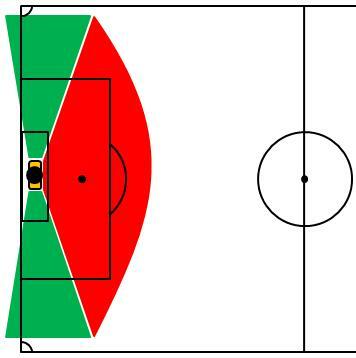 In these cases, who cares where the ball ends up as long as it is not in the back of the net? But for longer-distance shots that can be judged, they should be just as easy, if not easier, to deflect sideways. To counter high-velocity shots, I see many goalkeepers catch-and-drop the ball in front of them rather than try to catch it outright or deflect it away. This is a wonderful solution to the velocity problem. The ‘catch-dropping’ method prevents a goalkeeper from having to absorb the full impact of a shot. Since an attacker is rarely close enough to a goalkeeper, if the ball drops close to the goalkeeper’s feet, this method should preclude a goalkeeper from having to deflect shots kicked directly at him/her. I am no goalkeeper (I only recall playing in goal once in a JV game) and don’t claim to be one. And God Bless those players who want to play ‘keeper. You are a rare and special breed. But I think today’s professional goalkeepers are permitted to get away with poor and unnecessary deflections which is setting a bad example for youth goalkeepers. Therefore, while they are athletically superior to their predecessors, today’s goalkeepers don’t appear to be as technically sound.